The gallbladder is a small organ that sits near your liver in the right upper part of your tummy (abdomen). It stores bile, a fluid that's made by the liver. 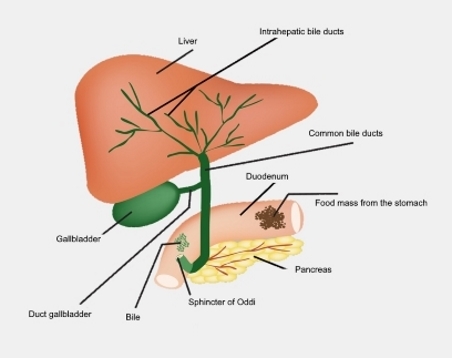 Bile is released from the gallbladder into your intestine when you eat to help you digest fat. Gallstones are common. They form in the gallbladder from bile salts, fat (mainly cholesterol), and calcium and can range from a single large stone to many small stones. They're more common in women than men and occur more often as people get older. In most people, there are no symptoms and they're often found on a scan arranged for other reasons. Gallstones cause a problem when they block the exit for the gallbladder. This causes a pain called biliary colic, which is the most common problem caused by gallstones. If the gallbladder gets inflamed as a result of this blockage it's called cholecystitis. Sometimes, the gallstones can move out into the main bile drainage pipe that also drains the liver. This may cause no symptoms at all, but it sometimes causes pain. If there's a complete blockage of the bile duct by a stone, bile can back up into your blood stream and cause yellowing of your eyes and skin known as jaundice. If there’s an infection, it’s called cholangitis. This can be life-threatening. Because the main bile drainage pipe also joins the pancreas drainage pipe, a stone lodged here can upset the pancreas gland too. This is called pancreatitis and can be life-threatening. Most people with gallstones have no symptoms at all. Biliary colic usually happens after a meal, especially a fatty meal, and causes a moderately severe pain in the upper right hand side of the tummy which may go through or around to your back. It may come and go in intensity and can last for several hours. You may feel bloated and sick (nauseated) or it may make you vomit. If you develop cholecystitis or cholangitis (with infection) you may have a more steady and severe pain that can radiate to the back or right shoulder. You may develop a fever and have nausea and vomiting. If your GP suspects that you may have gallstones, they'll refer you for an ultrasound scan that will show up stones in the gallbladder if they're present. The ultrasound may show a stone in your main bile drainage pipe. It isn't uncommon to find out you have gallstones when you have an abdominal ultrasound or CT scan for another reason. If you end up in hospital and initial investigations suggest there may be a blocked bile duct you may have an investigation called an MRCP (magnetic resonance cholangiopancreatography). This is another way to image your gallbladder and bile ducts. If you have no symptoms from your gallstones, then no treatment is needed. If this is the case for you, your GP may suggest following a diet that reduces your chances of forming more gallstones. See this sample diet sheet for guidance. If you develop biliary colic, your doctor will give you pain relief medicine. Occasionally, the pain can be severe and you'll need hospital treatment. If you develop cholecystitis or cholangitis you'll need to be treated in hospital with antibiotics and fluids through a drip. You'll be given pain relief as needed. If you have a gallstone in your main bile drainage pipe, you may undergo an ERCP (endoscopic retrograde cholangiopancreatography). It's a specialised camera test, where an instrument is used to remove the stones. If doctors determine that you need to have your gallbladder removed, this may be done while you're in hospital, especially if you're unwell. If your symptoms go away while you're in hospital, you may be put on a waiting list to have an elective operation. The most common operation to remove the gallbladder is a laparoscopic cholecystectomy. This involves removing the gallbladder using keyhole surgery. You have three, or four holes made in your tummy (abdomen) and a telescope and light are inserted to locate and remove your gallbladder. Occasionally, during laparoscopic surgery the surgeon may need to switch to an open operation, which will need a bigger cut. This will give you a bigger scar and need a longer recovery time. The surgeon will need to change to this if the operation is more difficult than expected and it isn't possible to get your gallbladder out through the keyhole method. Information about gallstones, including a useful diagram. Information about dietary changes you can make to help with symptoms of gallstones. Cholecystitis is inflammation of the gallbladder, and is usually caused by gallstones. This page gives more information about causes, diagnosis and treatment. Written by HealthInfo clinical advisers. Endorsed by General Surgeons Canterbury DHB. Last reviewed January 2019.